When working on a private aviation trip to Hyderabad, you will land at Rajiv Gandhi International Airport (VOHS). During preparations for your trip, if crew or passengers require scheduled private transportation during your time in Hyderabad, arrangements are available through Universal Private Transport. For inflight dining options on your departure from Hyderabad, your needs can be fulfilled through the Air Culinaire Worldwide® Network. As always it is best to plan your inflight catering needs at least 48 hours ahead for the details of your next leg, especially during peak season. 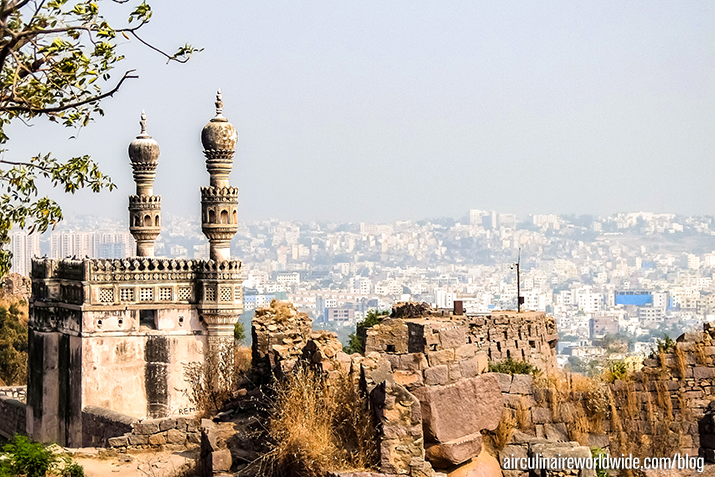 With a history that stretches back to the Iron Age, there are countless sites to visit while in Hyderabad. Some of the more popular places for tourists to visit are Charminar, a mosque built in the 16th century; Golkonda, a 14th – 16th century kingdom fortress known for its unique acoustics; Hussain Sagar, a large statue of Buddha located on a small rocky island in the middle of a necklace-shaped lake; Ramoji Film City, the world’s largest film studio covering almost 1700 acres; and Chowmahalla Palace, an 18th century Persian-style palace. Heavily influenced by Arabic, Turkish and Mughlai cultures, local cuisine in Hyderabad also comes with a vibrant street food scene. Many of the popular local dishes listed below you will be able to find along the bustling city streets. Hyderabadi-style Biryani, featuring spiced basmati rice and goat meat; Haleem, an Arabic dish of lentils, meat and a wheat paste; Boti Kabab, skewed pieces of ghee-basted meat; Mirchi ka Salan, curried chili peppers; Chicken, a spicy dish usually served as an appetizer; Lukhmi, an appetizer of triangular-shaped flaky dough filled with minced goat meat; Paya Nihari, a broth featuring lamb trotters / feet; Double ka Meetha, bread pudding soaked in milk spiced with cardamom and saffron; Murgh do Pyaza, a spicy chicken dish; and Irani Chai, a sweet spiced tea. If you have any questions about inflight catering for private jets in India, contact weborders@airculinaire.com.